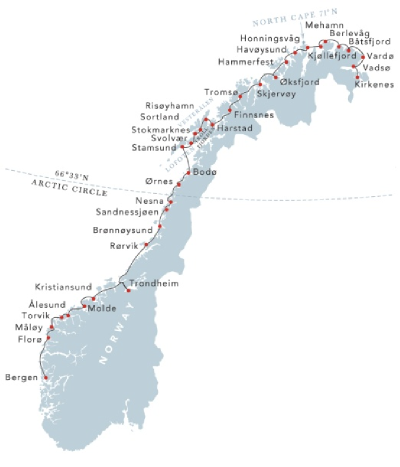 The Voyage North (Bergen – Kirkenes) is perfect for culture seekers as it includes daytime visits to the cities of Ålesund, Trondheim and Tromsø, as well as a midday call at Honningsvåg, portal to the windswept North Cape. 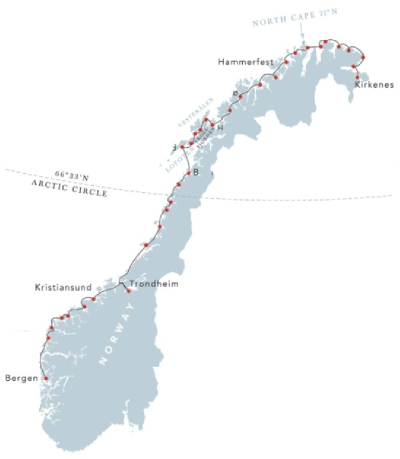 The Voyage South (Kirkenes – Bergen) is apt for visitors in search of incredible scenery as it includes daylight sailing through the idyllic, mountainous Vesterålen and Lofoten islands, past the Seven Sisters mountain range and Torghatten, the mountain with a hole in it! 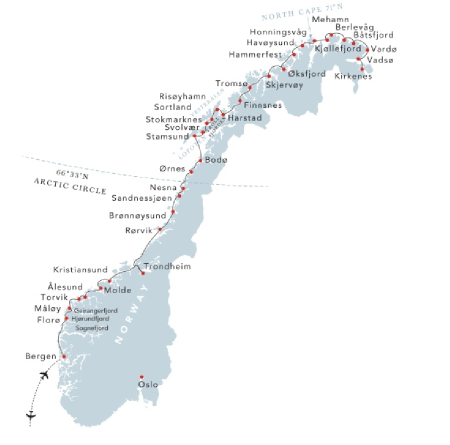 A journey from Bergen to Tromso or from Tromso to Bergen gives you a taste of the Arctic. Depending on which direction you choose to sail, you will experience many of the highlights of a Classic Round Voyage including sailing through the beautiful Vesteralen and Lofoten Islands, the Seven Sisters mountains and visits to fascinating towns such as Bergen, Tromso, Alesund and Trondheim. A voyage along Norway’s coast wouldn’t be the same without learning a little more about the Vikings! Were they philanthropists or merciless pillagers? Learn all about them with the British Museum’s Viking curator Gareth Williams. Before sailing from Bergen, you may wish to explore this cultural gateway to the fjords. Spend some time in one of the outdoor cafés and restaurants in the Bryggen district, a UNESCO World Heritage Site. Other attractions include the Fløibanen Funicular and the Fish Market. Sail further north to Alesund, a beautiful town noted for its Art Nouveau architecture. From here, you set course for the spectacular UNESCO-listed Geirangerfjord, where you can enjoy a scenic excursion including a breathtaking drive down the winding Trollstigen Pass. The architecture and surroundings in Trondheim create a beautiful setting for any outing, either as part of a guided tour in Nidaros Cathedral or a casual stroll through the Bakkland district. In the evening, continue to the Land of the Midnight Sun. 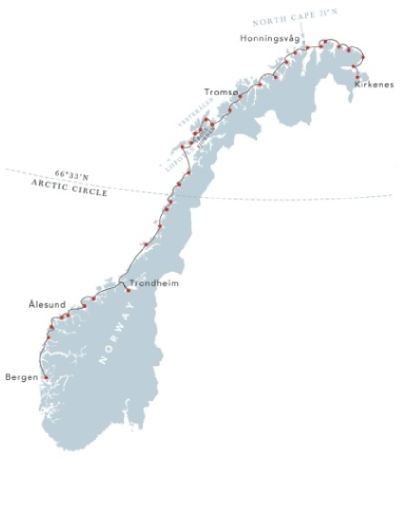 Crossing the Arctic Circle is one of the highlights before you arrive in Ornes. The Arctic Circle marks the southern extremity of the polar, 24-hour sunlit day – often referred to as the ‘Midnight Sun’. In the evening, you reach Svolvær, the picturesque capital of the Lofoten Islands. These islands are noted for their small fishing villages with their Bohemian atmosphere, surrounded by majestic granite cliffs and white sandy beaches. Complete your visit with a stroll between the stock-fish racks and ‘rorbuer’, the traditional, red fishermen’s residences. During the night, you pass the magnificent Trollfjord and sail through the spectacular and narrow Raftsund strait. Here, you can admire the rugged mountainous landscape jutting up against the horizon under the endless sun. Continue to Tromsø, a city with many lively restaurants and cafés. 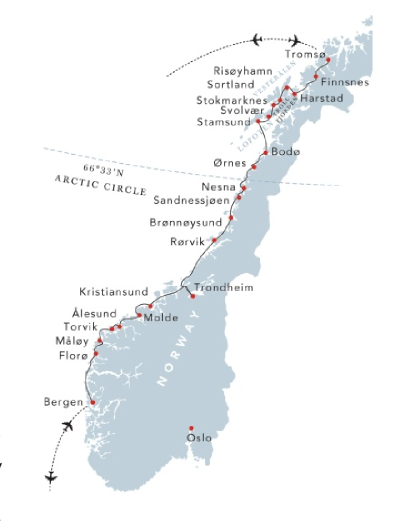 Arrive in Honningsvåg, the starting point of our optional excursion to the spectacular North Cape, the northern-most point on mainland Europe. From the fishing village of Kjøllefjord, you can get a ‘Taste of Lapland’ by meeting a Sámi family. The vistas and sea life become more dramatic as you approach Kirkenes, just a few kilometres from the Russian border and the Sámi communities of Northern Scandinavia. Summer in Kirkenes is superb, with an average temperature of 14°C in July. The town is known as the Capital of the Barents Region and the Gateway to the East, with people here speaking Norwegian, Sámi, Finnish and Russian. As you turn south, the northbound ports previously visited at night are now seen by day. Start the day with a summer breakfast at the North Cape Hall (optional excursion), firmly perched on the massive cliff marking the northern-most tip of mainland Europe. You also make a stop in Hammerfest before your next major port of call, Tromsø, where you can take part in a very special musical experience, the Arctic Cathedral Midnight Concert. Passing through the Lofoten Islands, the ship negotiates a stunning network of inlets and isles, before moving on to what is the highlight of the voyage for many, a possible detour into the spectacular and dramatic Trollfjord. You can join an optional fantastic RIB safari through the Lofoten Archipelago under the Midnight Sun! 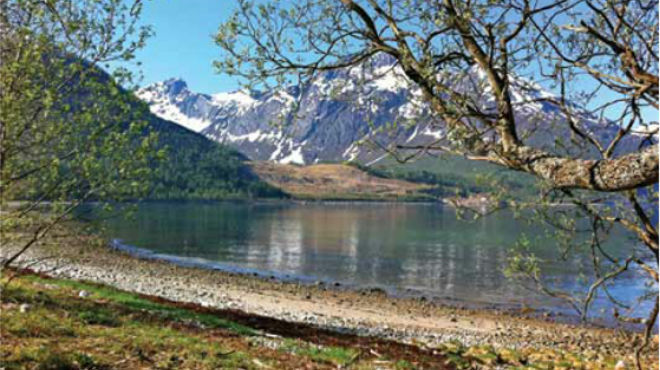 As you sail along the Helgeland coast, you can enjoy views of myriad islets, fertile farmland and lush meadows. This is the last day north of the Arctic Circle. The Vega Archipelago, a UNESCO World Heritage Site, is close to our call in Sandnessjøen and can be explored during our optional excursion. Arrive in Trondheim in the early morning. Nidaros Cathedral, in which three queens and seven kings have been crowned, is Scandinavia’s largest medieval building and definitely worth visiting. The town of Kristiansund, located on the scenic Atlantic Road, holds the rather obscure title of Norway’s ‘cured cod capital’ owing to the nature of its main export. Your arrival in Bergen marks the end of this magnificent summer journey.